My three-day pelagic with Tom Stephenson was great, but now I needed to see some birds in New York, and I was running out of time. 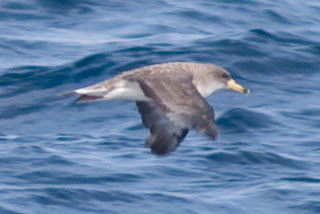 Certain pelagic birds like Audobon's Shearwater depend on warmer water, and as fall progresses they become less and less likely to be seen. I found a boat in Point Lookout going out to the Hudson Canyon, but weather was not cooperating and last week's scheduled tuna-fishing trip was cancelled due to rough conditions. In fact, the Marine Forecast for offshore had been looking pretty grim. There was a short window for relatively calm seas on Sunday and Monday, so that was my chance. After that, we'd be into late September or October and I'd likely miss a couple of birds I was hoping for. There are a few boats that go out this time of year for tuna, and I found one in Belmar, NJ who's website showed an overnight for Sunday, leaving at 5pm. I couldn't raise them on the phone, so I drove down and found their boat docked. The guys on board said no, they don't go out on Sundays...that was last year and no one had updated the website. I spoke to a few other captains and got a couple of schedules for trips, but nothing that would leave in sooner than a week. Resigned to waiting and hoping for the best, I got in my car. I did one quick check...I knew that the Jamaica did tuna trips, and I wanted to see what her plans were. I was in luck...she was leaving that day at 5. I got directions from a couple of old salts on getting to where she was docked (about 20 minutes away) and raced down there. Thankfully she was still there, and had a space for me. So at 5pm we steamed out of port and headed for the Canyon. 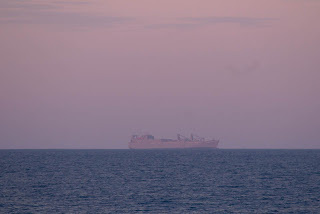 The Jamaica is a fast boat, and we cruised at high speed out to sea as the sun went down. I stood up in the bow so long as there was any light, and spotted a couple of Gannets and a few Wilson's Storm Petrels, but this was tough birding...basically like birding from a car cruising down the freeway. You'd spot the bird and maybe get one or two photos and/or a few seconds view before you were past it - the photographic equivalent of trap shooting. At dark I went down below and found all the fisherman sleeping in anticipation of being up all night in the Canyon. The bunks were by the engine room, with just a red bulb illuminating the room...sort of like being in somebody's basement in the 70's, if that basement were next to a revving Mack truck. I got some sleep, and woke up around 3am to find us idle in the Canyon, with all the fisherman working their jigs and bait over the sides. 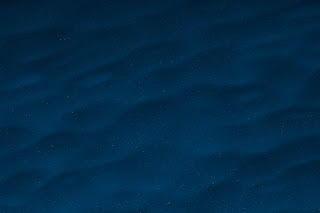 The water has a noticeably different blue color, and you can see down ten or twenty feet, just enough to give you a sense of the vast deep you can't see below that. 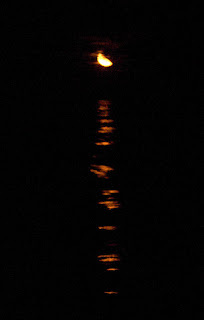 A red moon rose through the clouds and made it a little easier to see out over the water. I stayed up for about an hour, straining my eye for and movement that might be a storm petrel - as I'd seen on the Viking, a few birds came in to the lights, and I got a couple of ID-able photos, but they were all Wilson's (as opposed to Leach's, Band-Rumped or White-Faced, all much rarer). I got a couple more hours sleep and then was up at sunrise and on the upper deck scanning for birds. Weather was good, with tempatures in the sixties and seas at 3-5 feet. The night's fishing had been a total bust, so at around nine the captain decided to salvage the trip by picking up some Mahi-Mahi, which cluster around fisherman's buoys. We would go to one buoy, fish for ten minutes, pull up and go to another. This wasn't a bad way to see birds. I had several shearwaters cruise the boat, including Corey's, Greater, and one Manx. At one point I was amazed to be continuously scanning, looking in all directions, and then suddenly have a Corey's Shearwater right next to the boat. This is one of the several disadvantages of a tuna boat as opposed to a dedicated pelagic birding trip...the more eyes looking, the better chance you have. Often a bird just appears briefly, and if you're not looking that way, you just don't see it. Interspersed with the shearwaters were a number of storm petrels, which I examined with as much care as I could in case there was something other than a Wilson's out there...I had gotted some practice at this with Tom on the previous trip, so I had a least some idea of what to look for. Despite my efforts, though, nothing out of the ordinary fluttered by that I could discern. The camera is a great tool out on the water, and I photographed everything I could so I could look at the bird after it had passed...once again the images kept me honest, so even birds that I thought might be flying differently or that looked longer winged, in fact showed the marks of yet another Wilsons. My other useful tool was my GPS logger, which takes a GPS data point every ten seconds. When I get home I download the data and then attach it to the photos by the time that they were taken, thus confiming that I was in fact at the Hudson Canyon, and not some other spot of the captain's choosing. I've been told that if the crew finds you with a GPS they'll destroy it, and I've read as much on one boat's website, so I was careful to keep it discreetly hidden on my camera bag. The fishermen are proprietary about their fishing spots, and I imagine that the distinction between locating birds and fish might be lost on them if the GPS was discovered. 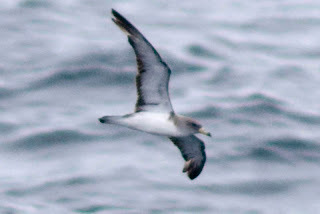 The three "best" birds of the day would up being two Pomarine Jaegers, one adult with long tail feathers, the other without, that both came in close to the boat, and (much to my relief) an Audobon's Shearwater. I hadn't see the jaeger with it's adult tail feathers, which stream out behind and then turn at a 90 degree angle to create a bulge at the end, and that was exciting to see. The Audobon's was a last-minute special, which I got just as we were getting ready to leave the Canyon. It flushed in front of the boat and then settled as we passed, allowing me to get a few shots that show it's characteristic white lores, one of the marks that disitinguish it from the similar Manx Shearwater (the lores are the areas between the eyes and the bill). The surprise of the day was a passerine that came flying by the boat around noon. At about 100 miles offshore, I wasn't really looking for a Red-Eyed Vireo, but that is what it turned out to be. Hopefully it made it's way back to dry land. We were back in port at 4pm, and I wove my way to the car, sea-legged and dry-mouthed from the rolling boat and the Scopoderm I use to prevent sea-sickness. It wasn't as spectacular a pelagic as the one I took with Tom (no whales, for example), but I'd seen a couple of new birds and spent another night offshore, and that's a good trip. Sunday morning I went out with Jess to get coffee and walk the dogs and do the crossword. I was contimplating how I was going to get out on the water again to look for birds in Hudson Canyon, and my plan was to go to the marina in Belmar, NJ later that day. When we got back I checked my email, and presto, a new and exciting bird. One of the rarities I had hoped for, Black-Throated Gray Warbler, had shown up in Central Park, a long way from it's regular territory on the West Coast. Within five minutes we were in the car and on our way. I texted Peter Dorosh, and we picked him up as well. In an hour we were parking by 81st Street, and hoping that the bird would be there. It was now an hour and a half since the posting, plenty of time for the bird to decide to go elsewhere, or even just move to a spot we couldn't find. We saw a couple with expensive binoculars as soon as we entered the park, and they pointed us to Tanners Springs, a little pool of water that attracts birds and that is favored by photographers in Central Park. We got there and there were four photographers with "big rigs" set up around the pool, cameras with monster 400, 500 or 600mm lenses set up on tripods with flashes and accessories. This was a good sign. We joined the dozen or so birders waiting, and soon had a bird coming down from the canopy that looked right. Sure enough, the Black-Throated Gray flitted into a shrub by the pool, then onto a branch (placed there by photographers for this purpose), and finally onto the ground to drink, about ten feet away. The cameras and flashes were firing like it was a celebrity sighting, which I supose it was. We got good long looks and I got a few good shots, before it flew back up into the big trees and out of sight. Peter and I smiled and headed back to Brooklyn, agreed that it was the easiest way to see a "hard" bird you could ask for. At about 7:30am was on the Penninsula in Prospect Park with Peter Dorosh, Mary Eyster and Tom Stephenson. The wind was good the night before, and we were hoping for a Connecticut Warbler, one of the trickier birds to see in the fall migration. 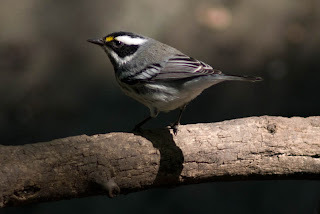 Like the other Oporornis warblers (Kentucky, Mourning, and Macgillivrays), Connecticuts are walking warblers: they creep around through the leaf litter, turning over leaves for bugs. This means that even if they aren't shy, they are hard to see, because they tend to be under leafy ground cover. Things were looking good, with some nice warbler activity in the trees around us. We had been there for about half-an-hour, carefully searching the good habitat that the Penninsula provides, when a bird called out about twenty feet away. Warbler calls like this are less common in the fall, when birds aren't defending or defining breeding or feeding territories, or trying to attract a mate. More significantly, the call was distinct and unusual, and I knew right away that it was something different. Tom said it could be Connecticut, and we thought he was joking until I played the call on my iPhone...it was an exact match! So now we knew the bird was there, and we spent another forty-five minutes looking without luck. We finally gave up and moved on, but Mary called Ed Crowne and let him know what had happened. Sure enough, about 1/2 hour later Ed called with the news that he had seen the bird about fifty feet from where we'd heard it. We went back and joined Ed. Oddly, I had just said something to Tom about a Lark Bunting. 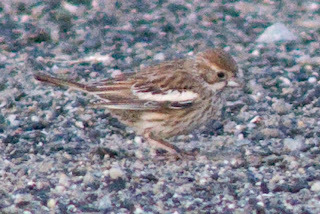 Not two minutes later I got a call--Lark Bunting at Robert Moses State Park. I spent a few more minutes hoping to photograph the Connecticut, but finally had to go in favor of the much rarer bird. I was out at RMSP in a couple of hours, and, as usual in the NYC and LI area, there were already a lot of birders there ahead of me. 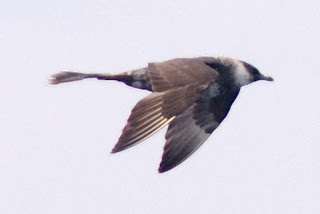 The Lark Bunting had been spotted by Doug Futyuma in a flock of House Sparrows. It was little ironic that everyone was trying to find a flock of House Sparrows, which are normally seen as a "trash" bird, and without much success. The Bunting hadn't been seen for a couple of hours at that point, but we were figuring that it would have to come back out at some point. Three hours later I was starting to question whether that was true, and after having a negative interaction with one of the over-zealous park workers (she told me she didn't want people walking around one of the maintenance areas because they were worried that someone was going to "poison the water supply", and no, I'm not joking), I had to abandon the search. Back home again, the inevitable happened--the Bunting reappeared around 6pm. So that meant up at 4:30, and at RSMP by 6am. 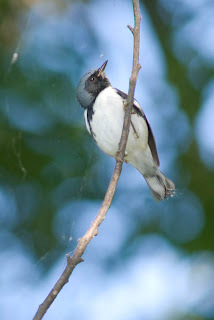 This time it was too early for the park workers, and it wound up being moot, as the Bunting appeared almost right away at daybreak, feeding with a large group of House Sparrows in the gravel and grassy areas where it had been seen the day before. I was joined by two other birders, and we got lots of looks at the birds, despite the surprisingly skittish behavior of the sparrows. It was dim and I was never close enough to get great photos of the birds, but I did get a few acceptable shots. Withing half-an-hour the flock broke into a few smaller groups and scattered around the area...I was seeing now why the bird had been so hard to see during the middle of the day. That proved to be true over the next few days, as people saw the Bunting at either dusk or dawn, but had a much harder time locating it at other times. 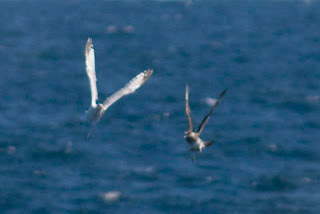 It was time to try for fall pelagics, those birds that spend most of their life over the ocean. The annual fall NY pelagic trip was cancelled because of high prices, so I had to make my own by tagging along on a tuna-fishing boat. These boats typically go to offshore canyons where the water depth plunges to many thousands of feet, and this is where you'll often find large congregations of aquatic life, including fish, cetaceans, and, most importantly, birds. On Tuesday night I packed up the car and met Tom Stephenson, and we drove the three hours out to the end of Long Island. We arrived early and had a beer before proceeding to the Montauk docks. At midnight the office opened, and we registered for the trip, and then boarded the Viking Star along with 12 fisherman and 5 crew. We steamed out of Montauk at 1am. At 7 the next morning we wake up in our bunks, and have a little breakfast. The bunks are in a single open cabin, and the overhead flourescents are kept on 24 hours a day, but somehow the motion of the boat made sleeping easy. It's a beautiful day, sun shining and calm seas, and we climbed up to the upper deck to start our bird watching day. The fishermen are already up, with a dozen rods set up for tuna on the lower deck. The water is sparkling as we troll through the rolling seas. Practically the first bird we have is a big, gull-like bird, cinnamon brown, that comes cruising up behind the boat. 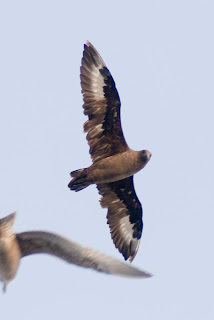 I start photographing at the same time I yell "Skua! Is that a skua?!". 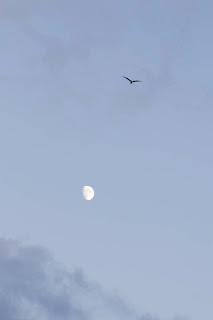 Tom confirms it: it's a skua, and it soars twenty feet over our heads, slowing flying up the length of the boat. It hovers right above us and then, having checked us out, soars back out to sea. It's an auspicious start to the trip. The next good bird pulls a similar move...it comes cruising up behind us, and then soars right over the upper deck. Similar to the skua, but not quite as heavy bodied, it's a Pomarine Jaeger. Again, a great bird to see and very exciting to have on the trip. I'm feeling great when I ask one of the fisherman when he thinks we'll get to Hudson Canyon. He says we're not going to the Hudson Canyon. I get a bad feeling in my stomach. I approach the captain and ask where we're going. He says we're headed to Atlantis Canyon...in Massachussetts. The fishing is better there, he says. So despite my calling Viking four times and asking each time about where we were going (and being assured it would be in NY), we're out of NY waters and will be for the whole trip. 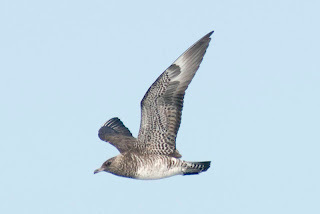 Nothing on the trip will count for my big year, including the skua and the jaeger. After a little wrangling with myself, I settle my mind and accept my fate, and decide to just make the most of it and enjoy what we see. And we do see a lot! Although the numbers aren't high, it seems like every bird we see is a new species. We have Wilson's and Leach's, Corey's, Greater, Manx, and Audobons Shearwaters, and (on the second day) another good look at a Pomarine Jaeger, this time chasing a Herring Gull for it's food. Jaeger means "hunter" in German, and these birds defenitely fit that description. Although it's quite a bit smaller than the gull, it manages to hector it until the food the gull is carrying drops from and is swiftly picked up by the Jaeger. Another great moment happened on the first night. The fisherman are fishing around the clock, and at about 3:30am I hear a shout that there's a swordfish on. 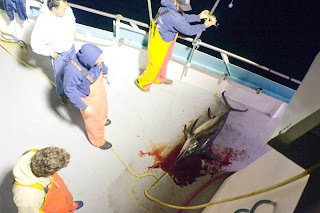 Having never seen a live swordfish, I get up and watch them reel it in, and then watch the bloody business of killing it, cutting off it's sword, and packing it off to the ice chest. A few moments later, one of the men calls out, "Bird guy! Bird guy!" I figure that's me, so I go around to midships and find that there's a Wilsons Storm Petrel that's just run into the boat. 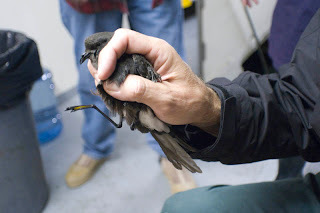 The Storm Petrels are attracted by the fishing boat's lights, and apparently this sort of thing isn't that uncommon. I pick it up the way I've seen banders handle birds, and I bring it inside and wake up Tom. We both get good looks and I take a few photographs before we let the now fully awake Wilsons fly back out over the water. In addtion to the birds, we saw lots of cetaceans. We estimated over one hundred fin and humpback whales over the three days, as well as numerous pods of dolphins. 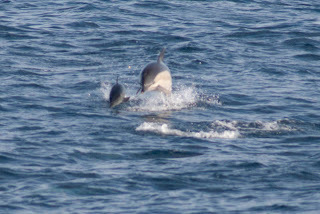 We had a pod that none of the crew could ID...subsequently Angus Wilson IDed them as either Nothern Bottlenose Whales or Cuviers Beaked Whales from my photos. 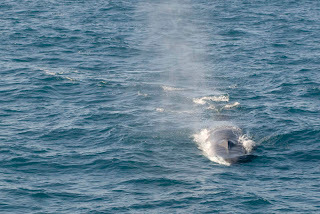 Several pods had calves with them, and one or two fin whales came within twenty feet of the boat. At one point we could see six different groups of whales all around the boat, all spouting. 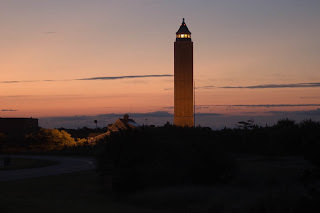 On the third day we motored back to Montauk, and for a couple of hours we were back in NY waters. Unfortunately, we didn't see anything new in that all-too-brief window, so the net of the trip for my big year was a zero. But I didn't regret doing the trip at all. Tom and I got a lot of practice looking at Storm Petrels, watching Shearwaters and even IDing whales. It was great to be with Tom, who is a sharp and very experienced birder, and, as it turns out, an excellent travelling companion. We both were happy to have had more experience on the water with these rarely seen but rewarding birds, and I'm looking forward to my next trip offshore, which will have to be sometime in the very near future. After a restless night, I woke up around 5am, and decided I might as well do some birding. Seeing as there are no current rarities in my area, I decided to go upstate and try to get better photos of a couple of birds I already have for the year. By about 7:30 I was at Bashakill, a beautiful wetlands preserve that I've already visited several times this year. 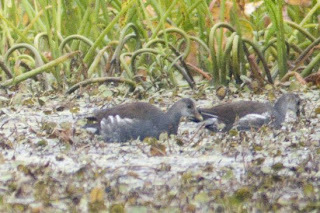 Using information from John Haas, the local expert for Sullivan and surrounding counties, I found a pair of Common Moorhens feeding amoung the vegetation there. 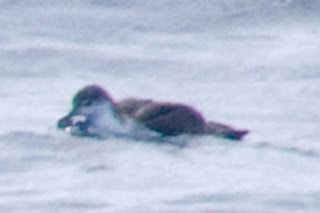 I'd seen this bird up at Perch River, but it was very distant and my photos were very poor. While these birds were still a little ways off, I got much better photos, and then spent and hour looking for rail and cuckoo and whatever else was around in the area. By 9am I was on Cooley Road in Sullivan County, where White Winged Crossbills have been seen regularly. 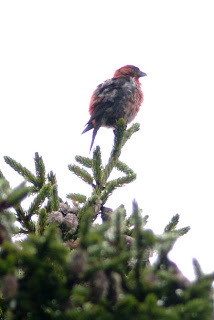 I ran into a couple of other birders who were already there for the same thing, and we had a couple of looks at one or more crossbills, perching high up in the spruce trees and singing. Again, I was able to snap some recognizable photos (previously, I only had an audio recording from Ferd's Bog). So far so good! 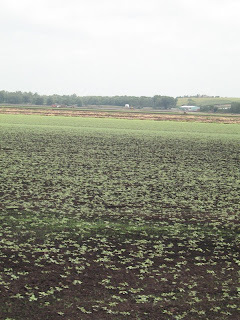 Around lunch time I spoke with Curt McDermott, and he mentioned that there was a birding group nearby checking out the sod farms. Sod farms grow, well, sod, and they are popular for birding in the fall when American Golden Plover, Bairds Sandpiper, and Buff Breasted Sandpiper are all possibilities. I met up with the group just as they were entering Pine Island Sod Farm, and we drove a in a caravan around the fields scanning for birds. Within minutes we were on a good-looking bird amound a large group of Killdeer. 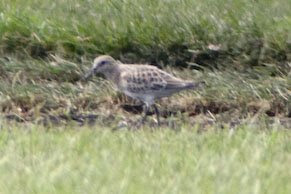 We conjectured that it was a Bairds, and when we drove up further we got close enough looks to confirm it. Again, I got some distant but recognizable shots. Three good photos in one day is excellent this late in year, and my collection of pictures is getting to be substantial. I have about 5,000 photos so far for the year, with documentation of 327 of the 328 birds I've seen, and only four of those are audio recording only (Whiporwill, Chuck-Wills-Widow, Red Crossbill and Sora). Only Black-Billed Cuckoo has eluded me altogether, and I still have a chance at that in the fall migration. I can't emphasize enough how the camera and audio recorder have allowed me to bird beyond my actual ability....birds that might otherwise be tough to ID can be either confirmed or disregarded from a good photo or recording, and it lets me share my experiences with all the expert birders in the state. : in a way it's like bringing the best sight and ear birders with me wherever I go. And just like birding with an expert, the camera keeps me honest...I can make as bad a call as I want in the field, but when I go home and look at the photos it forces to recognize what I was right and wrong about. It's been a great educational tool, and has accelerated my learning process significantly. Of course, I also love to take photos, so just getting a beautiful shot of what I see and sharing it is very satisfying.